Star Flyer was built in 1991 for Star Clippers as a four-masted, 170-passenger, tall clipper ship, technically a square-rigged barkentine. The ship currently ranks, along with its sister Star Clipper, as the loftiest tall ship in the world, with a mast that rises 226 feet high. Both ships, along with their bigger sibling, Royal Clipper, and a future ship, Flying Clipper, under construction, are the realization of a childhood dream of Swedish entrepreneur Mikael Krafft, and apart from the German-owned Sea Cloud ships, are the only authentic square riggers in the world offering a comfortable cruising experience (as opposed to the many sail training tall ships, where you sleep in bunks and have to sail the ship). This is the point of Star Clippers: You don't have to do any work at all, although you can play sailor by hauling on the ropes every now and then with the crew, or climbing the mast, under supervision. Sailing on Star Flyer is like stepping back in time to a golden era when clipper ships ruled the waves. The unfurling of the sails, to the stirring "Conquest of Paradise" by Vangelis, is a highlight of each day, and passengers can live out their nautical fantasies on the teak decks swabbed by crew dressed in jaunty blue and white sailors' uniforms or sunning in the nets hanging off the bowsprit. 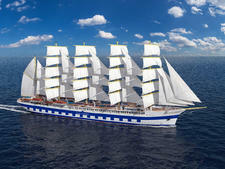 Although the ship is motorized, Star Flyer's engines are switched off as long as conditions permit, and the crew unfurls 36,000 square feet of billowing sails to capture the winds that can propel it along at a comfortable 8 to 10 knots, with a maximum speed of 17 knots (under engine power the maximum speed is 12 knots). On a typical cruise, the vessel relies exclusively on sail power around 25 to 35 percent of the time. Simply standing on deck, watching the ship sail out of port never fails to be one of the most popular, and most romantic, onboard activities, day after day. Because it takes a certain type to embrace the sailing experience on a small ship, shipmates tend to be kindred spirits -- active, open to new experiences, not at all stuffy or spoiled -- and after a few days passengers really begin to click. And suddenly, the trip is that much better for all the new friends you get to share it with. Star Flyer sails in the Western Mediterranean in summer and the Caribbean and Cuba in winter, offering repositioning voyages across the Atlantic twice a year. The ship's laidback atmosphere and its focus on sailing and water sports dovetail nicely with the Caribbean experience, or with the beaches in the Mediterranean; the company's itineraries favor lesser-known ports where possible, or beaches where the ship can drop anchor and ferry passengers ashore by tender. The Mediterranean itineraries feature plenty of popular ports, too, such as Cannes, Monaco, Valletta and Rome; the ship is also moored off Monaco every year for a special Grand Prix sailing. It can't be forgotten that there is a less idyllic side to sailing. Rough seas and bad weather can turn sea days into nightmares of seasickness and cause the ship, like any other, to delay or cancel its arrival into port. Although the vessel has stabilizers, a Star Flyer cruise is best for relatively hardy sailors as there is still considerable movement in rough seas -- if you're prone to motion sickness, opt for a larger ship where motion is much less. Unlike on some mega-ships, you never forget you're on a sailing vessel when you're onboard Star Flyer -- but most of the time, that's a good thing; and because the ship was built for "real" sailing, it cuts through the water beautifully. Star Flyer attracts a wide range of passengers and a more diverse crowd than you find on most ships. They include young honeymooners, retirees and sprightly nonagenarians, but the average age range is 50s to 70s. The ship also attracts a variety of nationalities, from Americans and Australians to Brits, French, Germans, Dutch and other Europeans. Announcements, daily programs and menus are always presented in English and German; sometimes French as well depending on passengers numbers. 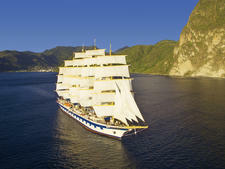 Many passengers are repeat Star Clippers cruisers and/or are sailing aficionados. Most are couples, either alone or in groups of friends, with a few families with older children. Passengers are typically well off, but are active, adventurous and friendly -- not stuffy or entitled at all. It's easy to make friends in the Tropical Bar, the main gathering place on deck, and open seating at meal times, and the sociability and inclusiveness of the ship is welcoming for people traveling by themselves (though fewer than 5 percent of Star Clippers' travelers go solo). The ship is not suitable for passengers with mobility difficulties -- lots of stairs, ledges to step over and rocking tender transfers could present a problem and there are no wheelchair-accessible cabins, and no elevator. 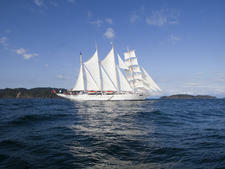 The atmosphere on a Star Clipper's ship is relaxed and easygoing. Daywear is quite casual -- shorts and T-shirts for land tours, swimsuits and cover-ups for beach days or lying on deck. Swim apparel is not permitted in the dining room. Women tend to wear nice slacks or skirts and tops or sundresses, while men stick to slacks and shirts with collar and sleeves. Jackets and ties are definitely not required. Shorts and T-shirts are not allowed in the dining room at night; the European contingent is, in any case, quite glamorous. Star Clippers' passengers sport a lot of logowear, too, wearing their past passenger status with pride, and first-time travelers stock up after a visit to the onboard shop -- particularly if the crew put on a "fashion show" in the tropical bar. A few nights are themed -- pirate night, for example, although most people didn't bother to dress up on our cruise. Others borrowed scarves and other swashbuckling accessories provided in a "dressing up" box. Passengers can opt for slightly dressier apparel for the Captain's Dinner (the waiters and bar staff change to black vests and ties, like pseudo tuxes), but it's definitely optional, and no one goes really formal. Don't forget to bring hard-soled water shoes -- some of the beaches are "wet landings," where you might get your feet wet. A sweater or sweatshirt is useful for more blustery sea days, as well as a hat that won't blow off in the wind, and non-slip shoes suitable for walking around teak decks. The suggested gratuity is €5 per person, per day for the wait staff and €3 per person, per day for cabin stewards. Individual envelopes for cash are provided and you can hand them in at the purser's office or sign a form to charge the gratuities to your shipboard account. Passengers are requested not to provide individual tips because all gratuities are pooled among the cabin stewards and dining room staff. Tipping of excursion guides and drivers is optional, but the line suggests a small gratuity is always welcome. No automatic gratuity is added to drinks or spa treatments. The onboard currency is the euro, and credit cards and cash are accepted for onboard payments.